While Google Tasks is great for personal task management, it has no social features. 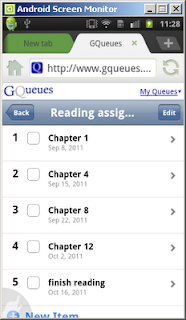 Gqueues is an app similar to Remember the Milk. In fact, it has the same yearly pricing plan of $25 for the professional version. One important difference is, that you and the people you want to share the tasks with do not need an additional account and Gqueues provides for gadgets for iGoogle and Google Calender (the professional version even syncs with it). 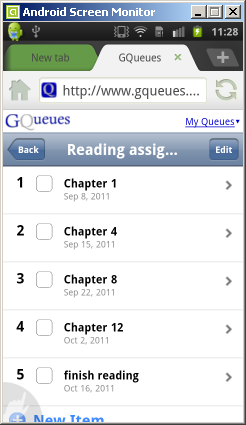 The lite version doesn’t allow for full task cooperation, but only viewing and sharing via copying. Even though that makes its use for project management very restricted, it is still useful for some tasks. E.g. you could share a coursework plan including deadlines. Reading assignments spring to my mind as a very useful application, as books usually have to be read over longer periods and several assignments. Go to Moodle and insert the embed code in a page. 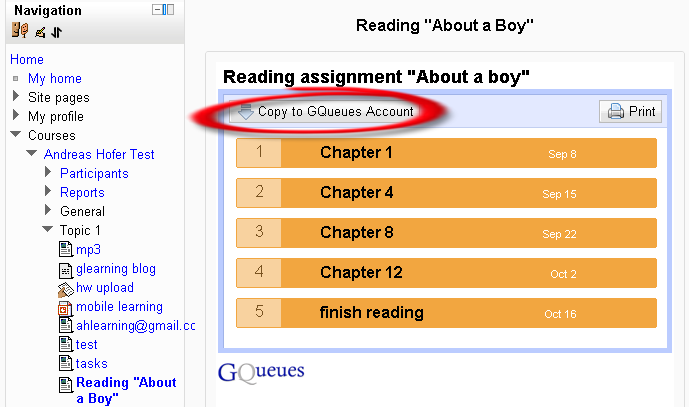 Those students who decide to copy the tasks into their own task lists have them available even on their mobile phones, whereas the reminder still has a nice online overview of all assignments and deadlines.